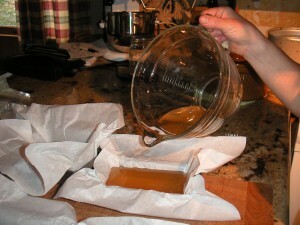 In this post, I detail the process that Shelli R. and I used to render 10 pounds of pork fat from Farm to Market Pork. We decided to try the crockpot method following instructions in “Livin’ High on the Hog: How I Rendered my own Lard“, and take photos along the way. 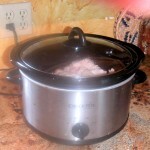 We did this in Shelli’s kitchen using three crockpots. We started with two 5-pound blocks of pork fat, and ended up with a little more than 4 pounds of rendered lard. NOTE: Some instructions add water to the fat, to help prevent scorching, but this makes the process stink, so we opted not to add the water. Set the temperature control to low, to begin melting the fat. Stir the fat occasionally to keep it from scorching, but remember that every time you remove the lid, you cool off the crock, so don’t overdo. 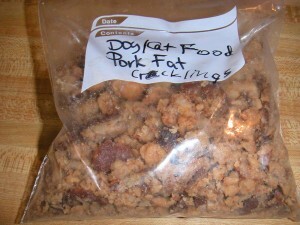 Eventually the fat will begin to bubble and the cracklings will begin to fry. 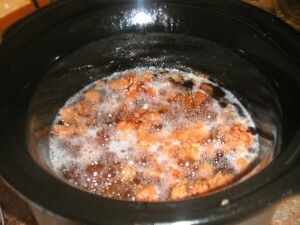 The mixture will be about 200° F, and you want it to reach 260° F. However most crockpots will not achieve this on low, so when it starts to bubble, increase the heat to high and give it a good stir. It takes a minimum of 9 hours to reach this temperature; ours took longer because we left the crockpot on low longer than we needed. 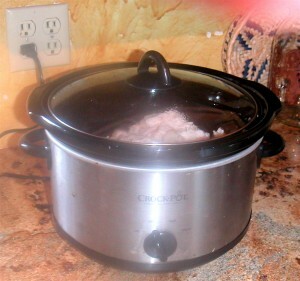 We noted that only the crockpot used in these photos got up to 260° F (the Original Crock-Pot Slow Cooker (R)). The other two (Rival brand) only got up to 235° F.
[The reason for 260° is to ensure all the water has boiled off, per Joe Pastry website(see comments)]. 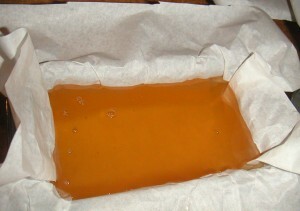 When the mixture reaches 260° F, it is ready for straining. Line a colander or mesh strainer with good quality cheesecloth (use double layer if the mesh is fairly loose). Set this over a large bowl with pour spout. We put a towel in the bottom of Shelli’s sink and set the bowl and strainer on top of the towel. This was to protect her glass bowl from the shock of hot fat against the cold porcelain sink. Shelli picked up the crock using an oven mitt, and poured off the fat and cracklings into the strainer. We let this sit for awhile, to allow all the fat to drip through the strainer. 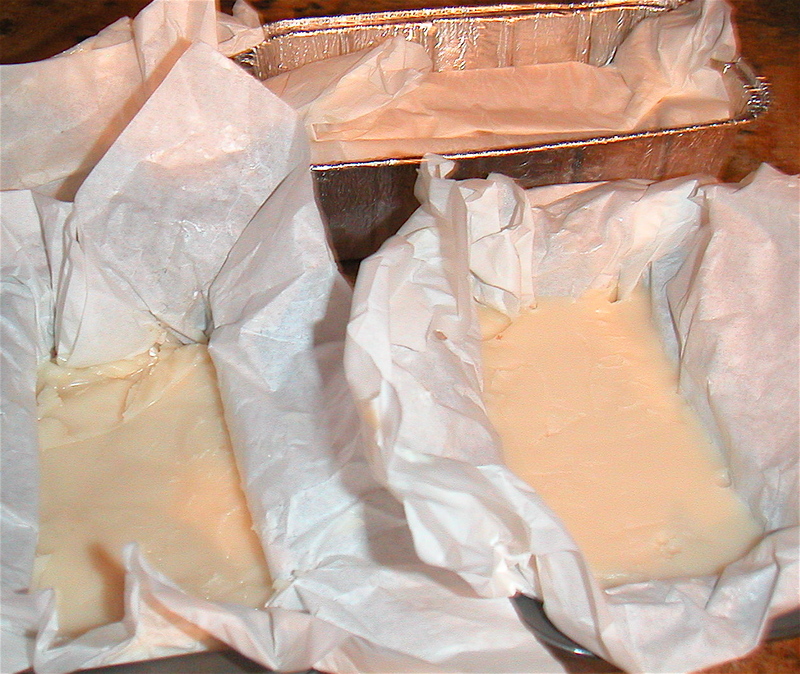 While the lard could be stored in canning jars, we decided to make blocks of lard that could be wrapped for freezing. 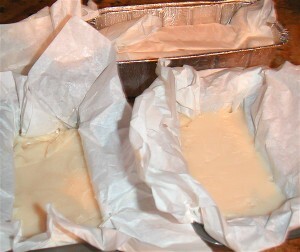 We used small bread pans as molds, and lined them with parchment paper to protect the hot fat, and for ease in removing the solid fat from the molds. If you want to store your lard in jars, it’s best to pour it directly into jars while the lard is still hot, and screw on the lids. As the hot fat cools, the lids will seal, the same as with canning. If you want to freeze it, it is best to pour into molds as we did, then transfer to the refrigerator to harden (room temperature lard is soft and not so easy to wrap). Then wrap in freezer paper, and label with the date. You can save the cracklings, if you like them, or compost them. Per Shelli’s suggestion, I will refrigerate my share of the cracklings for my cats. Like Shelli’s dogs, my cats LOVE them, and its good for their skin and fur, too. Unless you need a lot of lard at the same time, Shelli suggests doing only one crock-pot full at a time, rather than 3 pots full like we did. To save energy, she suggests doing this in the oven (300º F) when you are doing a roast so both are in the oven at the same time. You will need to consider that having two roasting pans in the oven will require longer roasting time, and your lard may need to remain in the oven longer than your roast. This entry was posted on Sunday, October 24th, 2010 at 11:23 am and is filed under Cat's Fats, Food-Nutrition-Health. You can follow any responses to this entry through the RSS 2.0 feed. Both comments and pings are currently closed. Hi, I did end up saving the cracklings. I fed a couple to my dogs and they LOVED it. So I’m going to ration them out over a period of time. Did you want some for your cats? Thanks a million! for the concise, straightforward information. Much appreciated. 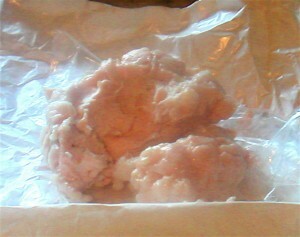 My daughter and I just finished rendering suet into tallow from the fat of a local grass-fed beef. We used an 18 quart electric roaster oven and purposely kept it set no higher than 225 degrees. So I was curious why your article insisted on reaching 260 degrees during rendering. we were following instructions from a blog (Livin’ High on the Hog), that said 260. But it seemed to be OK only getting to 235. He added water to his fat, but we didn’t add water, so that’s probably why we were OK at 235. Did you add water to the suet? BTW, great suggestion to use a roaster – similar to a crockpot but on a larger scale. Very good article. One question: At what temperature does lard ignite? 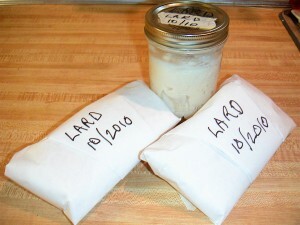 Veronica H asked via email: What is the temperature does lard ignite? Cat responds: Good question. I don’t know the answer but will research. OK, there are 3 temperatures pertinent to your question: smoke point, flash point, and fire point. — The smoke point of lard is about 370 F (Wikipedia), and is the point at which the fat begins to break down such that the fatty acids separate from the glycerol backbone. — The flash point of lard is 480 F (Materials Handbook); this is the point at which it will ignite, but will not sustain a flame. — Fire point is the temperature at which it will sustain a fire after ignition; I cannot find that temperature for lard. 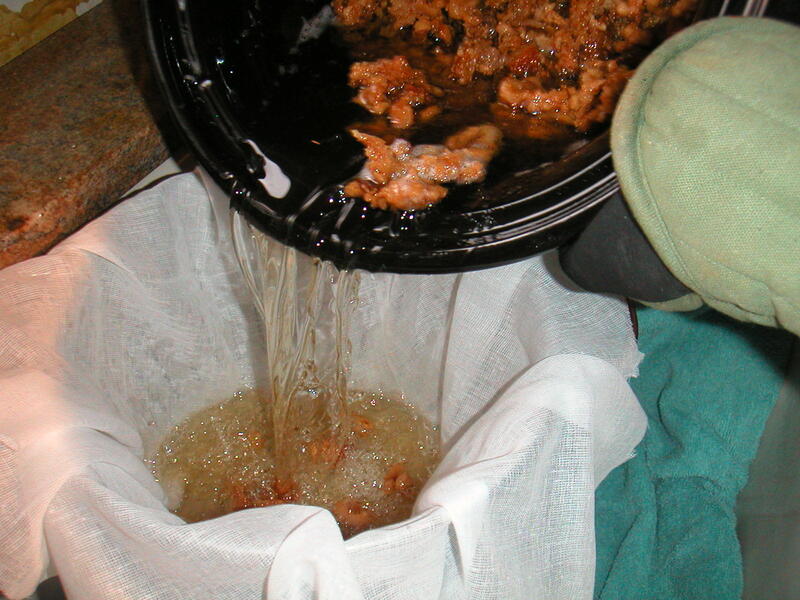 Rendering lard in a crockpot is thus quite safe since heating to 260 F is well below the flash point and thus should not lead to a fire. That is, unless your heating device is faulty.